Yesterday I got the strangest feeling. I scrawled the internet and then the name nCube pupped up in my mind. “In the old days” this was really a machine on which I wanted to have the privileges to work on (Oracle database wise). In those days I had the luck to work on a Oracle Parallel Server, Oracle version 7.x – I forgot the specs, implementation for dutch banking cooperation. 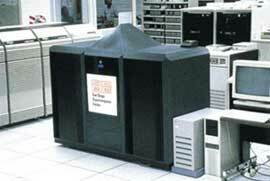 The machine we used was a 12 node (RS6000) IBM SP2 machine. I got the chance to work for 1 1/2 months with it, I guess this was in 1995, until they decided that the concepts of working on such a machine were to complex, so they decommissioned the hardware. The 12 RS6000 machines were dismantled and dedicated to different project teams working on the same paying chip card project. The SP series are probably best remembered by “Deep Blue“, the chess program that challenged and defeated Garry Kasparov in 1997. This event triggered me into looking into MPP, SMP, etc architectures. Terms like shared nothing caught my attention and I tried as much as humanly possible, in between working activities as a starting DBA, to read about this phenomenon. Two building further from my working place, my eye caught a glimpse of a black cube like machine called the nCube. I think I probably have seen a nCube3 when I reflect that it was somewhere in 1995. I wasn’t allowed to admire it, because I stood on holy ground and was mend for the trade floor / exchange section of the banking cooperation. Everyone knows about “Cray“, maybe because some younger people encounter some of those names still in old Science Fiction books. What counts as well is that Cray Inc still exists today. nCube is a different story. My mind remembers the nCube as a MPP machine with an enormous amount of CPU’s. Looking it up on the Wikipedia pages it says on the nCube page, a total of 1024 (nCube 2) up to 65k (nCube 3) CPU’s. Still today mind dazzling. I wonder if it actually performed. nCube apparently never had that big a share on the market if you have a look at the top 500 list for supercomputers in those days. What really worries me is that the wiki nCube page is short. They deserved better. What worries me even more, is that it is actually very very hard to find pictures on the net of a nCube system. On my search I found a nice Powerpoint presentation about parallel computing and its problems on the SDSC site. MPP never really made it in the commercial world of Oracle although Mr. Ellison tried it once with nCube. In the end it is a pity that its story is almost forgotten, at least if you take the Wikipedia nCube page as an example. Ah, this (from the Wiki page) is exactly what I’m talking about …. “I remember nCube well and how excited I was reading about them. I remember Oracle never stopped talking about them and it probably inspired an early interest in ‘parallel stuff’. I was never lucky enough to work on or even see one, but I was lucky enought to work at a site in Saudi Arabia that had a Cray II, Cray YMP (?) and an ES9000 mainframe with 6 vector processors (whatever that means ;-)). Then again, everyone had Sun workstations on their desk, so there was clearly a lot of money floating around! I never knew that Larry had bought nCube and then afterwards, apparently, more or less killed it… (there are very ugly stories out there if you take the time to find them…). As far as I have known the became a “Video-On-Demand” server company when they started to support Oracle Media (7.1/7.2?). But as said, there is not much out there anymore about the history of the nCube. Can anyone send me the presentation, what has been mentioned, the above link doesn`t work. I started in this business with nCUBE in 1990. Prior to that as a grad student I worked on one at an Amoco research center that has long since closed and been sold. She certainly was an interesting beast. 7 mip processor if memory serves correctly. The Ncube-2 scalability numbers above are wrong. 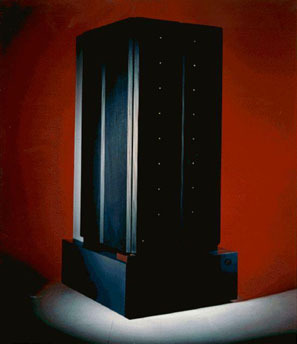 It would scale to 2^10 processors within a single cabinet, but you could connect cabinets together to activate 3 more dimensions to the hypercube taking it to 2^13 (8,192) processors. Personally, I never saw one bigger than 2k processors. The earliest Oracle parallel server we ran on the machine was Oracle 6.0.36 with parallel server. Later there was a 6.0.36 with parallel server and parallel query. The 6.0.36 port came from the VAX cluster implementation. We had quite a cast of characters. Steve Johnson (of YACC fame) was there for a while. (Incidentally, his license plate at the time was YACCMAN.) Our primary compiler writer had been a speech writer for Walter Mondale in an earlier life. In addition to pre-sales support for a brief period, I worked in development and wrote the drivers, test codes and example codes for the parallel video input I/O module. I think we sold one or two of those. It is interesting to think about the foundation upon which today’s cluster based supercomputers stand on. Back then, the tools were pretty primitive, the processors were slow, the routing hardware was either a wormhole routing mechanism (nCUBE) or Store and Forward (Intel), each machine had it’s own message passing API (MPI didn’t exist yet) debugging and performance optimization involved looking at the blinking lights on the front of the machine. The internet as we know it today didn’t exist beyond e-mail and news groups. Windowing Systems were very definitely not wide spread (read Winders wasn’t everywhere). It was the final days of the wild west of the pre-internet world. Every now and then I’ll run into a former ‘Cuban. We are definitely still around. Keep in mind, when I joined in ’90 I think I was employee #72. I would be surprised if the total # of former nCUBE folks is more than 500 so we are not all that easy to find. Thanks Mike for this cool insight. Really appreciate it. I surely remember nCube…I drove buy it often on the way home from my office at Sequent Computer Systems. There was a “Silicon Forest” with Sequent, BiiN, nCube, Floating Point Systems (all you UE10K fans owe them thanks) and others. A lot of Sequent folks took positions at nCube and visa versa. The Intel diaspora spawned a lot of technology offshoots in the 1980s. I’ve had a 32-node nCUBE 2L processor cabinet at home for years now (the central one in the photo with the peak on top) and occasionally look for spare parts and software to try to get it running. So few were made, though, that the search has been generally fruitless. If anyone wants some closeup photos of the hardware or has some parts for me, let me know here.